While Nikon dithers on replacing the D300s, we're slowly seeing other companies sneaking into the high-end APS territory. Today it's Ricoh with the Pentax K-3. 24mp, 8.3fps, an improved AF system, a Nikon-style metering sensor, dustproof and weather-resistent construction in a full metal body frame, and USB 3.0 support, all with the usual Pentax straight-forward controls and design. Oh, and throw in some extras, including a sensor-based stabilization system that can also vibrate to simulate an anti-aliasing effect (the sensor filtration doesn't have an AA component to it). All for a body cost of US$1300. 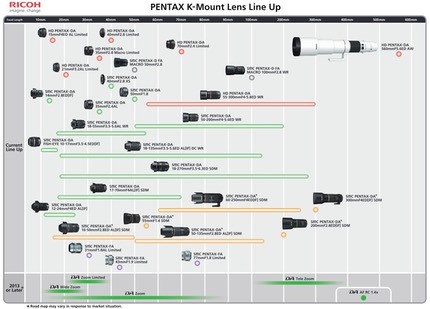 I've long written that Pentax has a more logical and interesting prime lens set for APS than Nikon does for DX. I suspect a lot of those primes are going to go to back-order status soon if the K-3 gets any traction in the market. Nikon's long replacement cycle on the D400 is now to the point where a lot of the audience is slowly drifting elsewhere. The lack of top end DX lenses doesn't give anyone any confidence that Nikon actually understands the high-end DX user. So let me put it as plainly as I can: people want a top DX (or as in the case of the Pentax K-3, APS) system for a reason: everything scales. Size, weight, and price. Sure, the D800 is a great camera. Now stick the f/2.8 or f/4 zooms on it and add up the size, weight, and price. You've left a lot of folk out of the market for a top-end, serious camera. I know a lot of college sports shooters and other pros who are using DX for those reasons: size, weight, and price. They can't afford a full out FX system, nor do they want to travel with one given the airline carry-on hassle we get these days. Put another way, Nikon either doesn't see a whole group of users, or has chosen to ignore them for a long while. That's not how you defend your position as one of the top two DSLR makers. Every time we get another launch from someone else or even a new Nikon DSLR that isn't a D300 replacement, a few of those previously dead loyal Nikon users start making other decisions. Sometimes they stick with a Nikon, but I'm seeing more and more of them pick something else. The remaining D300 and D300s users are not currently a happy crowd, yet from 2007 to 2009 they were amongst the most vocal in telling people how great Nikon DSLRs were. Here's the thing: the more time passes, the more impressive a D400 is going to have to be. Hope you've got something great in the wings, Nikon.